Single-cell RNA-seq is a powerful tool for revealing heterogeneity in cancer cells. However, each of the current single-cell RNA-seq platforms has inherent advantages and disadvantages. 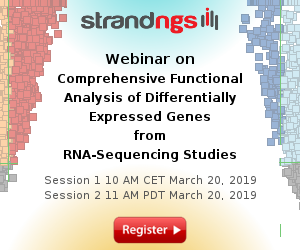 Here, researchers from the University of Tokyo show that combining the different single-cell RNA-seq platforms can be an effective approach to obtaining complete information about expression differences and a sufficient cellular population to understand transcriptional heterogeneity in cancers. They demonstrate that it is possible to estimate missing expression information. 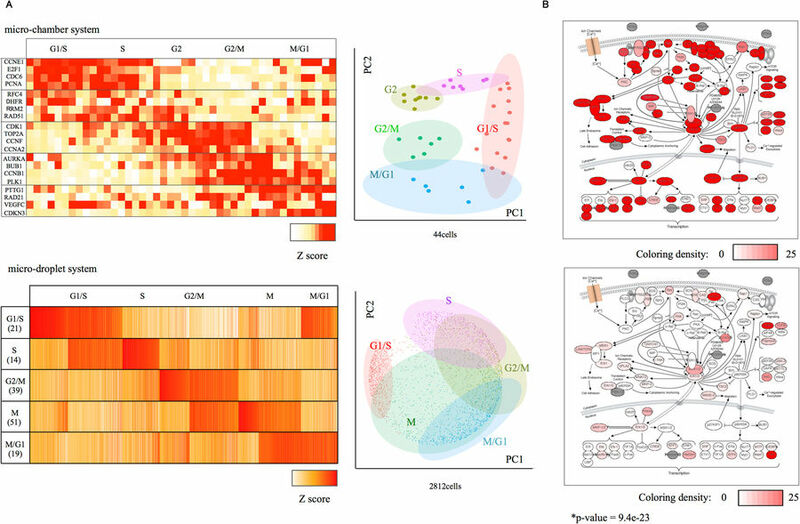 They further demonstrate that even in the cases where precise information for an individual gene cannot be inferred, the activity of given transcriptional modules can be analyzed. Interestingly, the researchers found that two distinct transcriptional modules, one associated with the Aurora kinase gene and the other with the DUSP gene, are aberrantly regulated in a minor population of cells and may thus contribute to the possible emergence of dormancy or eventual drug resistance within the population. (A) Cell cycle analysis of PC9 cells from the micro-chamber system datasets (top) and micro-droplet system datasets (bottom). A heatmap (left) and PCA analysis (right) are shown. (B) Gene expression information mapped to the MAPK pathway. The color density of the pathway represents the expression levels of the top1 cell from the micro-chamber system (top) and micro-droplet systems (bottom). The p-value of the Wilcoxon’s rank sum test is shown in the plot.